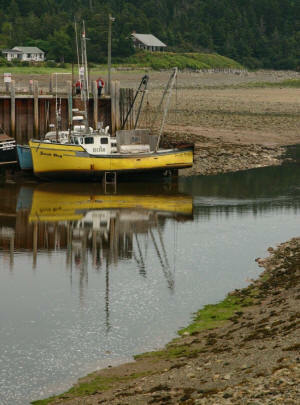 New Brunswick is one of Canada's ten provinces. It is an Atlantic or "Maritime" province. It can be found on the East Coast of the country, near the Atlantic Ocean. New Brunswick joined the Canadian Confederation in 1867. Check out our brief photo tour of New Brunswick if you'd like to see more of the scenery of the province or if you need photos for a school project. The provincial flag was adopted on February 24, 1965. The top rectangle has a gold lion on a red background. 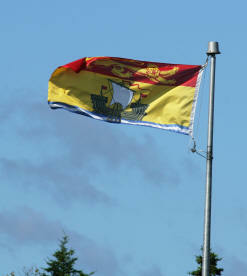 The gold lion is found on many provincial flags. It is a common British symbol. The ship shown on the bottom rectangle is an ancient galley. Shipping and shipbuilding were historically key economic activities in New Brunswick. The purple violet was adopted as the official flower of New Brunswick in 1936, at the request of the provincial Women's Institute. It has a delicate flower which people can eat. The black-capped chickadee is New Brunswick's official bird. It was adopted as the provincial bird in August 1983. The black-capped chickadee is found across much of southern Canada and the northern United States. Except in the northern-most locations, it stays over winter -- it does not "migrate". The black-capped chickadee eats insect eggs, larvae and pupae, weevils, lice sawflies and other insects. It hides food in secret locations just in case it has difficulty finding food later on. The black-capped chickadee male and female dig a hole in a dead stump that it uses as a nest. The female lays 5 to 10 eggs in its nest. The eggs are white with fine dark spots. They are so fragile that it is difficult to pick them up without breaking them. Hawks and the northern shrike are some of the black-capped chickadees' most dangerous "predators" (which means they kill and eat the chickadees). Weasels, chipmunks and squirrels enter their nests, or tear them open and eat the eggs or young birds.